Cuba is currently hosting ECLAC’s 37th session. May 9 (teleSUR) The United States’ “unjust blockade” has cost Cuba’s economy and its people over US$130 billion in economic activity over the last five decades according to the Executive Secretary of the United Nations Economic Commission for Latin America and the Caribbean (ECLAC). “We evaluate it every year… and we know that this blockade costs the Cuban people more than US$130 billion at current prices and has left an indelible mark on its economic structure,” Alicia Barcena said. The figures quoted by Barcena are similar to the economic impact the Cuban government has repeatedly cited in arguing against the measure. Cuba is currently hosting ECLAC’s 37th session, which brings together representatives from its 46 member States and 13 associate members to debate the main challenges for implementing the 2030 Agenda for Sustainable Development in the region. Over the last few years, the U.N.’s General Assembly has approved several non-binding resolutions calling for an end to the financial and trade blockade imposed on Cuba by the U.S. government since 1962. In 2014 former U.S. President Barack Obama eased the embargo, which can only be fully lifted by the U.S. Congress. However, last year president Donald Trump tightened travel and trade restrictions again. Earlier this week U.N. Secretary-General Antonio Guterres met with former president Raul Castro and the newly-elected Cuban President Miguel Diaz-Canel. During the meeting, the Cuban president vowed to continue to focus on development goals. “Despite the difficulties the Cuban economy is faced with, particularly due to the intensification of the blockade imposed on Cuba… we will continue to focus on the development goals set,” Diaz-Canel said. Guterres has praised the ECLAC’s work and called on the organization to continue to be a force for fair globalization. 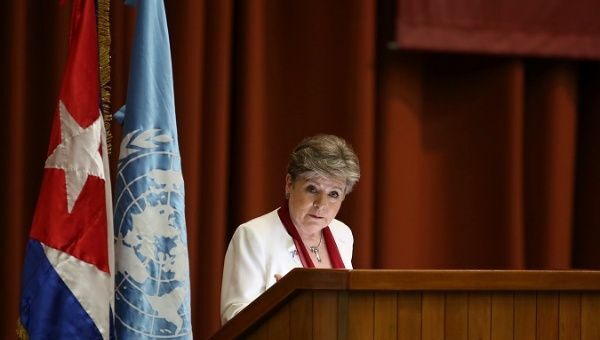 “Seventy years after its founding, ECLAC continues to be where it has always been — on the front lines pushing for fair globalization by producing evidence-based policies, technical analysis, and knowledge to help forge structural progressive economic transformation,” he said. Despite the blockage, Cuba’s economy has grown 2.4% on average per year over the past decade; official statistics show but the figure is below the 7% annual expansion the government has estimated it needs to facilitate a more robust development programme.